London is known for many things: Big Ben, tea and crumpets, Abbey Road...the list goes on. Being one of the world's most prominent business hubs, the city is also home to a number of world-class analytics firms. Datamine has been working in the UK since 1998, so we've got a fairly good sense for the other key players in the British analytics field. 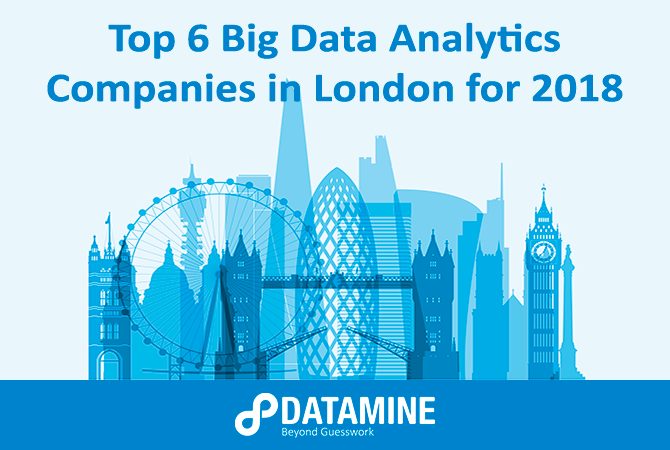 Therefore, we figured we’d put together a review of the best big data businesses in London for companies trying to determine what partner would be best suited to their individual business needs. Founded in Central London back in 2013, Mastodon C is a big data startup that offers two platforms designed to help larger organisations manage and analyse their colossal data pools. The C in the business’ name stands for ‘carbon’, so the company is also quite eco-conscious (namely, they make sure their computation is done in the greenest possible data centres). One of Mastodon C’s products is an open source data processing platform, and the other is a city-planning application that has garnered support from both the government and from Innovate UK - see the video below to hear more about that specific project. In addition to these two cloud-based platforms, the startup offers data science consultancy services for businesses that need a bit more guidance on their data analysis. PriceWaterhouseCoopers (PwC) is the world’s second largest professional services firm and is one of the ‘Big Four’ auditors. Their size has allowed them to branch out into new industries in recent years, and they’ve made a big splash in the data analytics scene - particularly in London, where they’re headquartered. In late 2017, the firm also confirmed that they’ll be partnering with Beyond Analysis to strengthen their visualisation products. PwC is quite versatile with regards to their analytics options - they offer consultancy services, platforms and access to their surveys, making them one of the best data analytics firms in London. The corporation also has offices in Northern Ireland, Scotland and Wales (not to mention in hundreds of other locations around the globe), meaning they’re easily accessible for companies throughout the UK. Founded in 2007, this small South West London-based consultancy is dedicated to ‘using data to increase social benefit.’ Mime Consulting works primarily with educational organisations (schools, universities, charities, local authorities and academy trusts) to deliver the value of data to young people and students throughout the country. The company has a number of education-based products for organisations across a variety of industries - particularly with regards to analysing educational trends in order to improve the overall system. Mime Consulting is regarded as one of the UK’s leading analytics providers in this sphere. Spend Network is a website that offers users the raw spending data of around 300 public sector organisations, dating back to 2011. This insight, in turn, allows other businesses and suppliers to forecast their pricing and spending timelines - the best part is that basic access to the website is free! If you want the Greater London-based team at Spend Network to organise and collate certain data for you or work with you to analyse it, there are downloads and services packages businesses can purchase that cater to individual needs. Though the website is most useful for government bodies and their suppliers, it’s still a helpful tool for other companies that also wish to glean insights from the UK’s public spending information. Founded in Bracknell, England (it's not London, but it's close!) in the early 90’s, Kognitio is one of the older analytics platforms in the UK - however, the company has deftly kept pace with technology over the years. Unlike many other similar applications, Kognitio is a Structured Query Language (SQL) engine designed in tandem with open-source software framework Hadoop - the platform allows companies with millions of rows of data to efficiently organise and analyse it at record speeds. In fact, Kognitio on Hadoop outperformed two other well-known engines (Spark and Impala) in speed tests conducted in San Jose in 2017. Like Spend Network, the basic level of this service is free, but companies can upgrade to paid subscriptions that offer more support from the Kognitio technologists and response team. The platform is particularly useful for businesses with a heavy focus on data science and business intelligence, though it can be utilised by any company looking for greater data visibility. IBM is a household name when it comes to technologies, and the century-old tech giant has been trying its hand at analytics software in the last few decades (and succeeding). With a number of platforms catering to data management, cloud data services and predictive analytics, IBM is a popular choice amongst enterprise clients in London. They've started off 2018 with a bang, announcing that they'll be simplifying their analytics pricing - their new platform bundling is designed to allow businesses to mix and match components over time as their business needs change. Fun fact: IBM Watson is also a partner to Wimbledon - the corporation has supplied the tennis championship’s data technologies since the 90’s. Other clients of the international business include big names, such as Honda, NASCAR and Nokia. Whether you’re looking for a consulting service, an analytics platform or a specific data-related product, there are dozens of companies across London that cater to various business needs – and these are some of last year's best ones. If your company would like to be considered for next year’s review, please let us know. Until then, keep updated with the newest data insights through Datamine’s blog and newsletter, and get in touch with us with any questions you have about your data and analytics!